Khaled bin Sultan. Living Oceans Foundation. Nigel Watson. I had the honour to serve as Captain of the superyacht Golden Shadow. 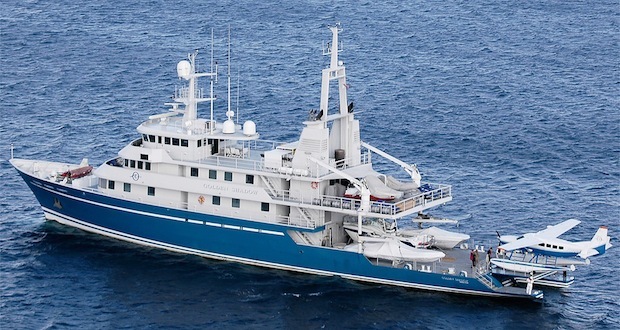 That vessel was was part of the fleet of Prince Khaled bin Sultan, and Prince Khaled’s Living Oceans Foundation has recently released a video which I hope some readers of this blog will be interested in viewing. This film discovers how conservationists and fishermen in Jamaica work together to help restore Jamaica’s coral reefs. Once known as the jewels of the Caribbean, Jamaica’s reefs declined over decades. Hurricanes, disease, and pollution have all taken their toll on the reefs, but the main culprit was overfishing. In order to thrive reefs need fish, but fisherman also need fish, and there are not enough fish left for either of them. Now in order to safeguard the fish and the reefs, fishermen are leading the charge to set aside no-fish zones. This film follows a team of scientists from Khaled bin Sultan Living Oceans Foundation and The Nature Conservancy as they work with the fisherman to create the first ever fish sanctuary in a remote part of Jamaica. According to Megayacht News: “Prince Khaled bin Sultan is not your ordinary yacht owner. Besides being a member of the Saudi Arabia royal family, he is a passionate conservationist”. In an interview with the magazine, Prince Khaled said” “As a young boy in Riyadh, I spent some time wandering the desert, and was surprised to find the fossilized remains of sea creatures,” he explains. “I realized then that much of the flat, endless desert of Arabia was in fact an ancient seabed.” Many years later, as he enjoyed cruising and diving trips, he began learning more about the threats the oceans and ocean life faced. He founded the Living Oceans Foundation in 2000. Read the full interview: Megayacht News — Megayacht News Leadership Series: Prince Khaled bin Sultan bin Abdulaziz, Living Oceans Foundation. Photo of Golden Shadow from Superyacht News.